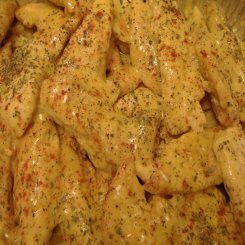 This chicken recipe is very quick and very tasty, you will be out of the kitchen in 20 minutes tops. The recipe also does very well doubled which makes it ideal for large crowds. These ingredients serve 4 to 5 people depending on what you decide to serve it with. I like to serve it with boiled baby potatoes that have been rustically crushed and tossed in better, parsley and black pepper as well as green beans. You can also use the sauce as a creamy pepper sauce for steaks and it also goes very well with pork so have a ball with this one, it’s a keeper! Heat your oil in a pan on a medium heat and toss in your chicken pieces. Cook them, tossing them about for about 5 or 6 minutes until they are almost cooked and lightly browned. Now add the wine, paprika and mustard, give it a stir and leave it to simmer for about another 5-6 minutes. Lastly stir in the creme fraiche, taste, season stir and serve! Give it a little sprinkle with some paprika once on the plate. How would this recipe freeze, Graham? I made this quick mustard sauce and put it over pork chops. It was really nice, however I did not know which white wine to use. Do we use a dry, sweet, semi sweet, stein? What do you use? Thanks for a good receipe, want to try it again with the correct wine. Thanks Graham, going to try it again for sure. Really good with pork chops. actually, this one looks better 🙂 going to try it rather! 🙂 thanks for all the wonderful recipes.